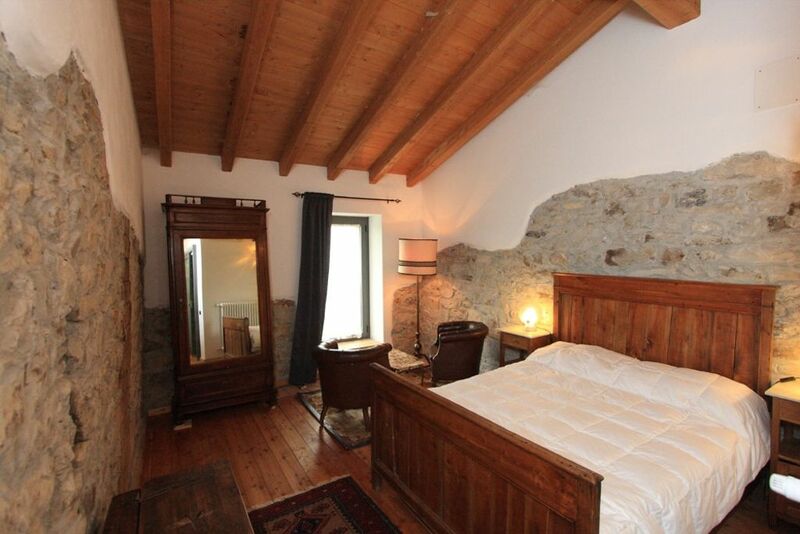 At the center of the property of 30 hectares of our Organic Farm, there is the old stone farmhouse of 1600 with two halls and 7 rooms with bathroom, each room can be reserved individually or combined with others. It is a farm that offers accommodation in rooms with bathroom and terrace or private garden, with buffet breakfast service included in the cost of accommodation and possibility to make a full dinner at our family run restaurant of exclusive home cooking dedicated to the guests. club house in the old barn with fireplace, TV, reading room, darts and chess, table football. Patio as an outdoor lounge and outdoor restaurant for dinners. The bedrooms are spacious and comfortable two to five seats, available TV, bathrobes, hair dryer and shower gel. Cleaning and linen change every 3 days. Pets and one room has access and facilities for disabled people. Wifi and parking. The use of the kitchen is NOT available. In our restaurant with home cooking, are prepared and served only to our guests who apply, wholesome dishes of Italian cuisine with the use of organic products from our farm. NEWS ': we renovated the interior and exterior furnishings of the room Giardina, Greek and overview. Ask us for details. For bed and breakfast (cakes and homemade jams) rooms can be booked individually with a minimum of two people or, for large groups, all the rooms can be booked. In this case all the services are for the exclusive use of the group. DISCOUNTS: for each type of family or group, in relation to the selected rooms, the presence of children and the length of stay, personalized cost estimates are made, also for half board or just a few dinners: contact us for more information! The house has 3 floors with independent access and offers the possibility of choosing between 7 different rooms with bathroom. Some double rooms, some large for families. The master bedroom, for example, offers two separate rooms: one with a double bed and a large bathroom, suitable for parents, but not adjacent to the room with 3 single beds for children. The Greca room, on the other hand, consists of two interconnecting rooms with a large double-bed bathroom, a bedroom with a double bed and the other with 3/4 beds for the children. Depending on your needs, if you are a small group of families and / or friends, we will propose the type and number of rooms that best suit your needs, with the possibility of dedicating 1 or 2 floors in exclusive, or if you need all the rooms, you can also reserve the entire house, with exclusive services. In the house there are 2 common halls inside and the patio with the outdoor area for moments of relaxation or dinners and lunches outdoors, keeping your private area if required, without forced sharing of space with any other guests of the house. You can spend your vacation finding yourself to celebrate a birthday, an anniversary, a wedding; you will have a dedicated lounge exclusively for your small group where you can meet, play, listen to music and have dinner or lunch, if you wish to reserve the service of our restaurant. Despite the possible presence of other guests, we will be able to provide you with exclusive and confidential situations. The use of all of our services are FREE. We can arrange carriage rides, horseback riding, wine tasting and visit local dairy of Parmigiano Reggiano, visit the vineyard and wine cellar Piacentino near the ancient village of Vigoleno and Castell'Arquato, tour and tasting at our workshop production of craft beer . The property: The cottage is set in 30 acres of organic farm with private forest and orchard of ancient fruit and olive trees, small fruits (raspberries, strawberries and currants) .With the organic production of barley and wheat, we get the malt to produce our craft beer. There are two sources, constructed wetlands plant, rainwater collection tanks and spring, photovoltaic system on the roof and in the field. Activities nearby: We included in the Regional Park Stirone. There are circuits for trekking, mountain biking, horseback riding, Carriage rides, tour and tasting at the dairy of Parmigiano Reggiano, in winery and vineyard, in the laboratory of bakery with bread oven. Affiorazioni of ancient geological eras: offioliti. The castles of the Duchy of Parma and Piacenza (Bardi, Vigoleno, Scipio, Castell, etc.). Terme Salsomaggiore Terme, Tabiano Terme S. Andrea. Adventure park Parmaland. Golf club Salsomaggiore Terme a few minutes. Not distant city historical / cultural as Parma, Cremona, Pisa, Bologna, and Cinque Terre. Our house is particularly suitable for families or groups of friends who will have exclusive use of all our services and organize celebrations for anniversaries, weddings, birthdays or other events. We also have a large living room of over 100 square meters to be used for group activities: yoga, dance, theater, meetings of any kind. We organize together your stay including meals, according to your particular needs. A beautiful home set in a lovely region of Italy! Our hosts were kind and accommodating, even taking us on a tour of the Parmigiano Reggiano factory! We had a great stay, however everything is quite a along drive (bigger cities). However if you're interested in medieval castles it is a great place to stay. All facilities were of great quality. Alles wie auf den Bildern! Perfekt, keinen Katalogbilder! Auch nach 7 Jahren sieht der Pool noch genauso aus! Respekt und vielen Dank an Alessandra und Maurizio für die tolle Zeit in eurem kleinen Paradies. Essen, Zimmer, Service (und Abstand) genau wie man es sich wünscht. Wir waren 6 Familien und hatten das Haus für uns. Wir wurden toll versorgt und hatten eine tolle Zeit bei perfektem Wetter. Everything exactly like on the pictures! The pool looks like new even so 7 years old. Congratulations and thanks to Alessandra and Maurizio. Thanks for the perfect stay in your little paradies. Dinner, Rooms, Service (and distance) was perfect. We have been 6 families and occupied the hole house. Alessandra took care for us. We had a great time with perfect wheather. Also for us was a perfect week! Thank you so much for everything, it was really a pleasure to meet you and your wonderful group. See you another time in Alleluja country House! Wunderschönes Haus, herrliche Lage - werden bestimmt zurückkommen. Allesandra ist eine sehr gute Köchin und als Highlight gibt es noch selbstgebrautes Bier! Stirone regional park near the golf course of Salsomaggiore Terme. Salsomaggiore and Tabiano, Castles of Bardi, Vigoleno, Scipio and Fontanellato, Soragna and Castell'arquato. Busseto: birthplace of Giuseppe Verdi, Parma, Modena, Mantua, Cremona, sea 120 km, rafting river Trebbia, mountain biking and hiking trails. Horseback riding along horse trail, Via Francigena and archery. Located in a farm of 33 acres of organic crops, two springs, scenic location and great walks in the woods with great bio-owned swimming pool with salt water and outdoor hot tub, beach volleyball court and pyramid energy. Wellness area with turkish bath, sauna and whirlpool color therapy. Other Activities: Birdwatching, Mountain biking, visiting farms and farms producing Parmigiano Reggiano, wineries and wine production workshop production of craft beer. Golf: Golf Club Salsomaggiore Salsomaggiore Thermae and Golf Green Fee 18 holes. Il prezzo a persona per notte comprende, oltre alle dotazioni previste in camera, l'utilizzo dei servizi aggiuntivi della struttura: bio piscina e vasca idromassaggio riscaldata all'aperto, bagno turco e idromassaggio con cromoterapia sempre disponibili, servizio bar, salone e club house sempre aperti. Attrezzature di svago e relax (calcetto, ping pong, campo da beach volley e piramide d'energia sempre disponibili. Include la colazione. Esclude solo la ristorazione e le bevande. Comunicando la presenza di bambini fino a 12 anni è possibile, in base alle camere disponibili all'atto della prenotazione, ottenere uno sconto. Qualora si trattasse di un gruppo che desidera riservare tutte le camere e quindi la proprietà ed i servizi in esclusiva e senza la presenza di altri ospiti, verrà comunicato il preventivo di costo dell'intera proprietà comprensivo di colazione a buffet. In ogni caso non è mai disponibile l'uso privato della cucina.